On May 24th, our official relaunch party for the new store took place and was a day to be remembered. Established for four years now in the Mile-End, Vestibule has quickly become a flagship store for lifestyle lovers looking for both the perfect dress and the perfect vase. With more products now offered, the new store has been established in a local 3 times bigger to continue to offer it's customers a clean space where it feels good to shop. The exciting addition: a coffee corner is now available in the shop to allow everyone to do two of their favorite activities at the same time: stoping for coffee and shopping. The opening event was directed by the local company Raisonnable, who took charge of the planning of the theme, the set up and organization of the entire concept and the coordination of the sponsorships. In short, a full-on service! According to your needs, this consulting agency in design and planning helps you realize the event of your dreams. 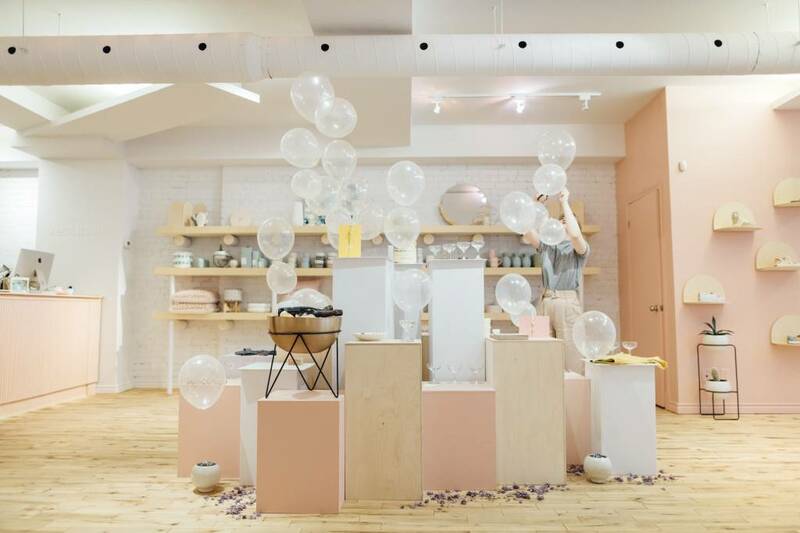 The launch of the shop being so beautiful, imagine how your wedding could look ! To finally realize your Pinterest dream, contact them to learn more! The launch day began with the arrival of the media to discover the brand new space. Flowers, cocktails and bites were waiting for them. A huge thank you to our sponsors: Comptoir Rhubarbe, Dose Juice, The Cavalier Petrone, Laurie Anne Atelier Fleur without whom this event would not have been as wonderful and as representative as Vestibule's brand. Our wonderful team of the day, including the precious women behind the company Chad Communication, was there to welcome all this beautiful people! Later on, it was the turn of our wonderful clients, who have been encouraging us for 4 years, to discover this new place specially designed for them. Gift bags full of goodies waited patiently for the first comings. Thank you to all our partners: Bkind, Three Times a Day, Hobeika Art, Zoe Boivin, Natasha, Savan, Sloane Tea, Ponyride Distribution, Johanie Creative. Beautiful spring bouquets embellished our window for the best first impression. But most of all, thank you to our beloved clients, without whom none of this would even be possible! You have been a crowd to come during our launch and we are so grateful! Thank you so much to everyone who made this event possible! Come and discover our new space located at 5170 boulevard Saint-Laurent. Vanessa Béland is the owner of the local business Fleur maison and is a content creator for Vestibule.